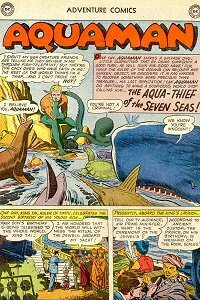 Adventure #276 (Sep 1960) - The Aqua-Thief of the Seven Seas! When Aquaman's attempt to salvage lost diamonds comes up with an empty box, he's accused of stealing the gems. Quotefile: Prime Minister Vuda, "I have another theory, sire! How do we know Aquaman's telling the truth? Maybe he's pulling a trick! Maybe he intends to keep the gems for himself!" Finny Friends Report: On the splash page, Aquaman's finny friends console him him through fish-telepathy. Aqualad, while riding a porpoise, uses electric eels to short-circuit a pirate submarine's electrical system. Whales push the sub to the mainland. Aquaman uses an octopus to help dig the chest out of the mud. A shark and two swordfish go with Aquaman to an iceberg to make fake diamonds. The whole adventure starts with the celebration of the prince of Timtu's second birthday, at which the child will receive his weight in diamonds. We get to see the ceremony, then see the chest that contained the diamonds sinking overboard. The King tells his PM to call Aquaman. Aqualad shows his stuff in this one by taking on a pirate submarine single-handedly as Aquaman rushes off to help the Timtu folks. The prince's nurse points seemingly randomly at the water to show Aquaman "exactly where the chest fell". Without Aqualad to back him up, Aquaman is accused of thievery when he fails to find the gems. The speech balloons by the fish on the splash page are a little shocking. Aquaman's thought balloon indicates they are speaking to him in fish-telepathy. The scene on the splash page never happens. Aquaman's reputation is never in any real danger, and his quick thinking preserves it from whatver minor damage it might have sustained. UPDATE: Rob at the Aquaman Shrine spotted an audio adaptation of this story over at League of Ordinary Gentlemen Comics.